In the annals of great cinematic collaborations—Martin Scorsese and Robert DeNiro, Tim Burton and Johnny Depp, Hitchcock and blondes—a new classic is taking shape: director Joe Wright and actor Keira Knightley. 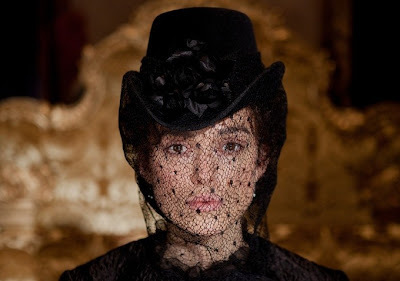 Wright directed her in both Atonement and Pride & Prejudice to amazing effect, and now Anna Karenina makes it three. 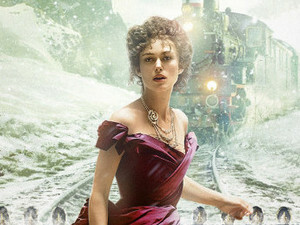 Knightley is an amazing actor, able to convey great emotion with great naturalness, so I had no concerns there. More worrisome to me, after viewing the first trailers, was the casting of Vronsky. Aaron Taylor-Johnson did not appear to be the charismatic powerhouse I was expecting; he looked more like a callow youth, a lightweight. 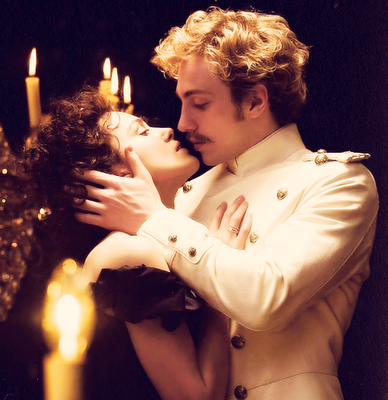 But he was an admirable Vronsky: he had chemistry with Knightley and a sneaky gravitas underneath that blond mop. 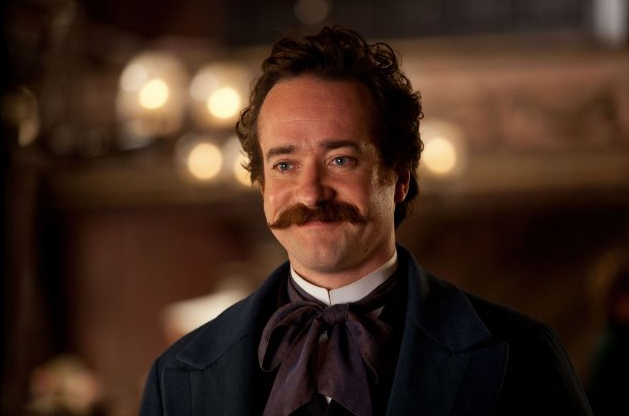 The surprise of the bunch, though, was Matthew Macfadyen as Oblonsky. It took me a good twenty minutes to figure out why he looked so familiar, and wow—what a performance. Macfadyen usually plays characters who are quiet or intense, so his bonhomie and comic turn were a revelation. I left thinking that Macfadyen could be the British Tom Hanks, a kind of Everyman in looks, able to play any type of character. Kudos, too, to screenwriter Tom Stoppard. 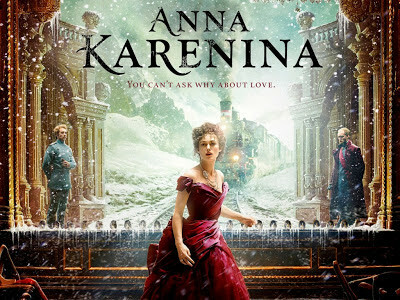 Anna Karenina is a long, complex novel, and its greatest achievement is its realistic psychological detail. Stoppard's ability to condense the plot is impressive enough, but he also manages to include some of the most important psychological moments of the novel, even if it's just two lines of dialogue, one minute of screen time. For instance, Levin is given to lengthy philosophical churning in the novel—always personal, never just abstract, but still a matter of just thinking. 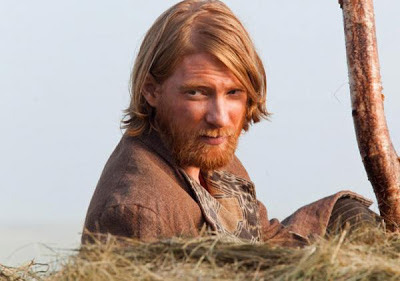 Toward the end of the film, a field worker tells the spiritually skeptical Levin that he needn't be so loyal to reason, that he didn't, for example, pick his wife out of reason. And you can see a light go on in Levin's head. He recalls (in a quick flashback) the moment that he laid eyes on Kitty and knew he had to have her, and he sees the truth in the field worker's statement. In that moment he's freed from his slavery to a strict rationality, and he discovers a path to spirituality that doesn't feel dishonest to him: a simple recognition that love is a miracle, a great and by no means natural presence in the world. He rushes home to tell Kitty of this revelation, because that's what true partners, true spouses, do: they share what's going on in their heads, and cherish the fact that someone cares. Levin arrives home to see Kitty playing with their baby, and he gets caught up in it, suddenly not feeling the need to explain his revelation. In the span of a scene that can't be more than two minutes long, Stoppard manages to fold in three important aspects of the novel: Levin's spiritual struggles, the intimacy and partnership that make a marriage good, and the psychological vagary that is one of the hallmarks of the novel, with characters taken with a feeling or idea one minute that feels stupid or unnecessary to them the next. One of my favorite scenes was the ball scene in which Vronsky and Anna first appear together in public and Kitty recognizes that Vronsky has lost interest in her. The attendees engage in an utterly fake form of ballroom dancing but one that serves the story brilliantly. 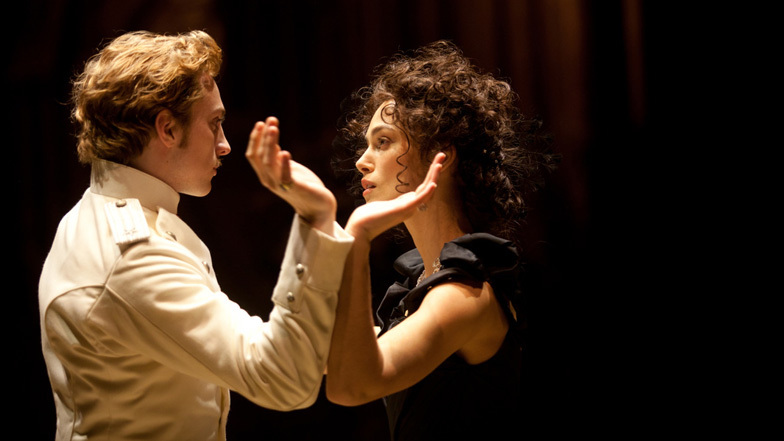 The dancers' hands weave back and forth, signaling entanglement for Anna and Vronsky. 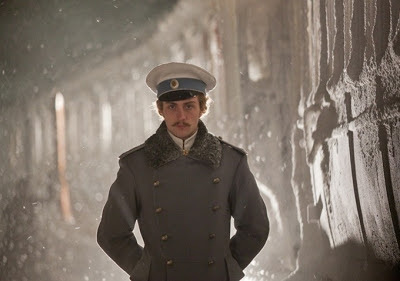 For Kitty, foisted off on old men and straining desperately to catch sight of Vronsky, those weaving arms are a cage that keep hemming her in, not allowing her to escape and reach out to Vronsky, to pull him back from Anna's orbit. Fans of his adaptation of Pride & Prejudice will remember that amazing scene when the servants close up Netherfield, lofting white sheets in the air to drape over the furniture, as the camera backs farther and farther out of the room, onto the balcony, and finally outside the house altogether and the servants finally close the shutters, signalling the shutting down of Jane's hopes. The backing up of the camera through the window and out past the balcony created the same kind of framing that is so prevalent in his Anna Karenina. It's encouraging to see Wright's outside-the-box adaptation alongside the Wachowskis' adaptation of Cloud Atlas. 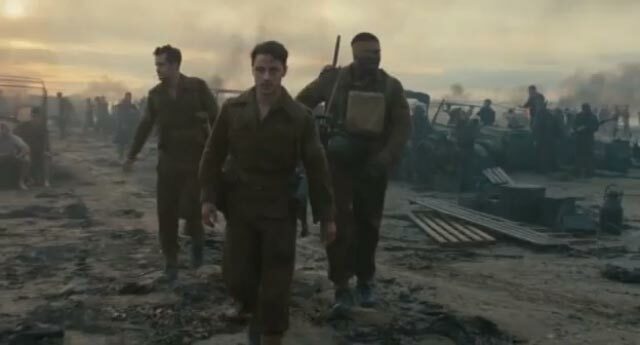 Maybe a new era of experimentation in relatively mainstream films is brewing.